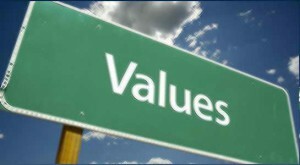 Each person has their own set of moral and material principles, values. For me, it is love and respect for your family and people that surround you, work and personal development. However, nowadays the values that passed down from generation to generation are slowly disappearing and changing. It can be argued that money is one of the reasons for this. Today, people are driven by wealth and are influenced by money. Most people seem to believe that money is the key to everything, when in reality it corrupts their human side and destroys them. Moreover, many teenagers become influenced by modern movies that portray war or even the opposite – an ideal world which no problems. This makes them believe that by having a lot of money, a big house or an expensive car would make them happy. This is, however, not true. People have stopped being sympathetic to one another, they do not know what kindness is and they work day and night out of selfish reasons and not for someone or something else, such as their own city or their country. I am just like everyone else and I do not stand out from the grey crowd of people. Just like everyone else in this world I have a loving family, a job, I eat and sleep, I have fun and I enjoy myself with my friends. However, I do not want to live like this grey crowd. I am always trying to improve myself and I am determined to do more, to achieve more and to never sit around waiting. I aim to improve my way of life, obtain higher education and develop my way of thinking and behaving. I am very critical of myself and this encourages me to improve every aspect about me. The above stated reflects each person as well, because everyone tries in their own way to improve something or work on themselves. Some might, for example, give more attention to others, some might give less and then there are those that would not care at all and live isolated as if on an island. Because we live in such a tornado of experiences, desires and goals, we tend to forget about what goes on around us. We get so tangled up in our own problems that we don’t even have the time to reflect on problems that are always present in the world. We are used to focusing on small daily problems that are nothing compared to global problems of our day. We only need to turn off our phones, the television, and the radio to be alone with our thoughts. Even to just sit for some fifteen minutes in an empty room will get you thinking about what is wrong with our behaviour, what we could do better or what we need to improve. These are thoughts that would not normally come to us alone, especially is we are busy with the bustle of everyday life. We simply need to slow down and act less, because in reality our actions may be wrong. We need to stop creating problems for ourselves from nothing and change our attitude to life. When we stop and reflect, the world doesn’t. Life goes on and so do problems. We tend to rush our actions and sometimes we regret the choices that we make because we start to question whether we took the wrong turn on our path or if we should have done something differently. Sometimes we may even realize that we didn’t need to do anything except to wait for the problems to sort themselves out. Everyone has their own problems and everyone tries to deal with them in their own way, but the real problem is that moral values are slowly dying. This is especially true nowadays because the state is having a bad time and the economy is suffering heavily. We discuss unemployment and the economic crisis most of time today. People are always in a rush to get everything done, to work day and night so that they could get by somehow during this hard time. Therefore, we can’t speak of any values if people are so focused on their material wellbeing. This is an enormous problem, in my opinion, because there are many people who don’t value their own lives not even mentioning love, friendship, justice or kindness. People have stopped sympathizing with one another, becoming cold and mistrustful of others. Every day we hear news about terrible events such as catastrophes, killings or terrorist acts (at the moment the Paris terrorist attacks are a hot topic). Even in Ukraine the list of problems is too long. All of this, in my opinion, is an attack upon our moral values which is becoming successful and slightly worrying. People are ready to perform the worst actions for money, degrading themselves. Our ancestors lived in peace, knowing what love is, but today all of that has been replaced by money. Therefore, I strongly believe that we need to tackle this problem and to show the contemporary society examples of values such as love, respect and kindness. Everyone has become selfish, satisfying their own needs. People seem to forget that all the best things in this world are free – love, friends, family, smiles and happiness. People nowadays don’t value what you have achieved, your goals or what you feel. What they are interested in is the brand name on your clothes, what type of phone you have or car and so on. All of us are humans and each one of us is special and different in their own way. We all have qualities or characteristics that cannot be repeated in any other person and this confirms our individuality. There are millions of people on this planet and other species. So how are we different from plants, animals and insects? How often do we think about our existence on Earth and what is means to be human? We have been granted such privileges that other species don’t have, but do we use them in the right way? We have been given such an amazing power of intellect, but do we fill it with the proper knowledge and do we put it to good use? ‘Do you know that you are a human?’ is what Vasyl Symonenko asks and this encourages us to think about our existence. Is everyone actually aware that they are indeed human? Do we accept it and acknowledge it with our whole body and soul? Humans are the most ungrateful beings in the universe. I think that to embrace this fact we need high moral values, rational actions, wishes, hopes, desires, understanding of others, sympathy and kindness, determination to improve ourselves. The answers to the questions we ask ourselves can be found in literature. The treasure chest of literature is full to the brim with lessons and examples which we refer to in everyday life. Many Ukrainian writers explore the theme of material and moral values of humans; the most notable are Lina Kostenko, Vasyl Symonenko, Oles Gonchar, Lesya Ukrayinka, Tras Shevchenko, Panas Murniy and Ivan Bagryaniy. I would like to use Lina Kostenko’s character Griz Bobrenkov, in her novel ‘Marysya Churai’. Having betrayed love, Griz betrayed himself at the same time, because it destroyed his inner soul and being. Marysya’s love is described as reaching heaven with its forehead, while Gritzko walked below on Earth. The most important thing is not moral or material values in a person, but his or her love and sheer devotion. These qualities are what define a true human being. History also presents heaps of examples, such the revolution in 2014 in Ukraine. Only people with such high moral values are willing to sacrifice their own lives for the cause of their own decency and honour. When people sacrifice their lives like this, it is clear that moral values play a dominant role within us and that material values become nothing in the face of these moral principles. However, it is sad truth that among us live those without honour or moral values, ready to shoot others in back and kill women and children. Therefore we need to question our essence of being human and what it means to us, as we were created in harmony not destruction. A true human being is one that has a pure heart, a kind soul and high moral values. This entry was posted in Ethical on 10/04/2016 by Mary.